Banjul is the third largest city and capital of Gambia, the smallest nation on the African continent. In 2003 the city had a population of 357,238 people or about 19% Gambia’s total population of 1.89 million people. The city’s name is from a local Mandinka word for a distinct fiber that was previously harvested on the island for making rope. Banjul occupies an area of 12 square km, or 7.5 miles, and lies at the mouth of the Gambia River on the edge of a small island called Banjul or St. Mary’s Island. The city has a subtropical dry and wet climate with heavy rains from June to October and Harmattan winds that blows during the dry season. The history of Banjul began long before the first Europeans arrived. It was settled some 10 Centuries ago by African ethnic groups from the interior. The British arrived on April 23, 1816, founded a town and named it Bathurst after Henry Bathurst, the Secretary of State for the British Colonies. The British chose this location because they needed a way to better control access to the Gambia River and enforce the Slavery Abolition Act of 1807. The act not only prevented British involvement, their warships also stopped American, French, Portuguese, and Spanish vessels still engaging in the slave trade. Over the next 20 years Bathurst would become one of the West African hubs for British anti-slavery naval activities. By 1843 Gambia had become a colony with its own Governor. In 1889, however, the town was declared the capital of the newly established Crown Colony and Protectorate of Gambia. When Gambia became an independent nation in 1965, Bathurst was named the nation’s capital. Gambian officials changed the city’s name from Bathurst to Banjul in 1973. 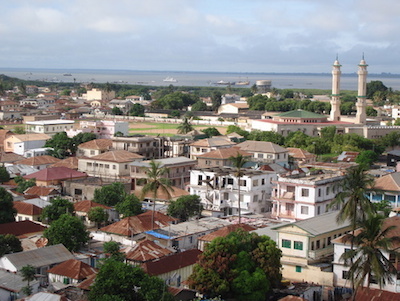 The landmarks and festivals around Banjul reflect the area’s rich culture. Arch 22, located at the end of the Independence drive, commemorates the bloodless coup on July 22, 1994. A museum within the arch displays the country’s history and culture. Wildlife is plentiful around the city and the River Gambia National Park has a host of different animals. Banjul Demba is the most popular of the local festivals. Celebrated during the first week of January, the festival puts local and traditional culture on display. The May Day sports festival is celebrated on May 1st and draws people from around the greater Banjul area. Banjul is a diverse city and has many different ethnic groups including the Mandinka, Fula, Wolof, Jola, and Seres. Although tribal languages frequently spoken on the streets of Banjul, English is the official language. Islam is the most popular religion with more than 90% of the population practicing the faith. Roman A. Cybriwsky, "Banjul," Capital Cities around the World: An Encyclopedia of Geography, History, and Culture (Santa Barbara, California: ABC-CLIO, 2013); "History of Banjul," History of Banjul, http://www.accessgambia.com/information/banjul-history.html; "Banjul Map," Maps of the World, http://www.mapsofworld.com/the-gambia/banjul.html.